All publications below funded entirely or in part by CADMIM. (1) Z. Sonner, E. Wilder, J. Heikenfeld, G. Kasting, F. Beyette, D. Swalle, F. Sherman, J. Joyce, J. Hagen, N. Kelley-Loughnane, R. Naik, “The Microfluidics of the Eccrine Sweat Gland, Including Biomarker Partitioning, Transport, and Biosensing Implications,” Biomicrofluidics, 9(3), 031301, May 2015. 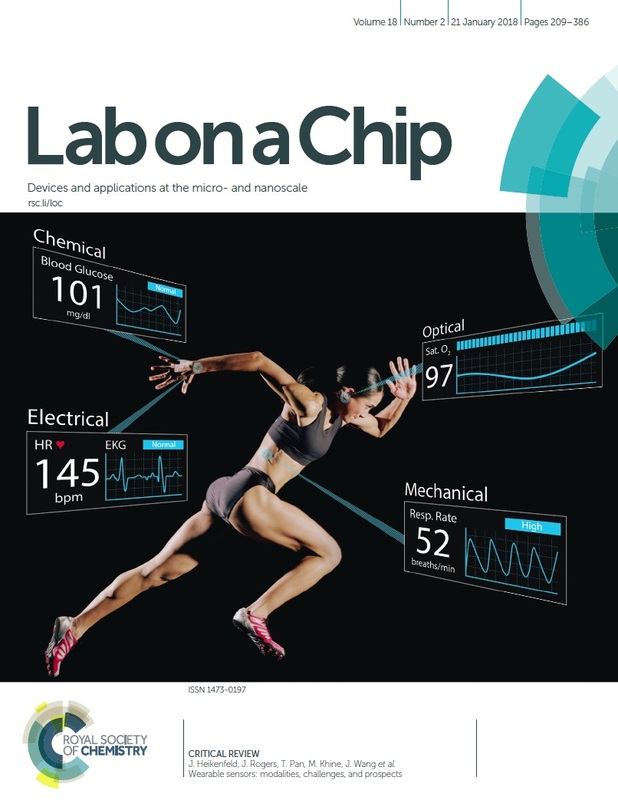 (2) Daniel P. Rose, Michael E. Ratterman, Daniel K. Griffin, Linlin Hou, Nancy Kelley-Loughnane, Rajesh R. Naik, Joshua A. Hagen, Ian Papautsky, Jason C. Heikenfeld, “Adhesive RFID Sensor Patch for Monitoring of Sweat Electrolytes,” IEEE Transactions on Biomedical Engineering, 62(6), pp. 1457 – 1465, June 2015. (3) S. Babikian, G.P. 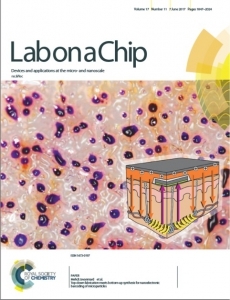 Li, M. Bachman, “Portable Micro-Fluidic-Opto-Electronic Printed Circuit Board for Isotachophoresis Applications,” 19th International Conference on Miniaturized Systems for Chemistry and Life Sciences (MicroTAS 2015), Gyeongju, Korea, October 25 – 29, 2015. (4) Nivedita Nivedita, Neha Garg, Prithviraj Mukherjee, Willy Feng, Abraham Lee, Ian Papautsky, “Integrated Microfluidic System for Rare Cell Separation and Enrichment,” 19th International Conference on Miniaturized Systems for Chemistry and Life Sciences (MicroTAS 2015), Gyeongju, Korea, October 25 – 29, 2015. (1) G.K. Kurup, Naiqing Zhang, Garri Arzumanyan, and Abraham P. Lee, “Trap & Release: Deterministic single bead encapsulation in droplets,” 20th International Conference on Miniaturized Systems for Chemistry and Life Sciences (MicroTAS 2016), Dublin, Ireland, October 9 – 13, 2016. (2) Neha Garg, Abraham P. Lee, “Highly Efficient Trapping of Rare Cells in Whole Blood Using Acoustic Microstreaming,” 20th International Conference on Miniaturized Systems for Chemistry and Life Sciences (MicroTAS 2016), Dublin, Ireland, October 9 – 13, 2016. (3) Xiao Wang, H. Gao, I. Papautsky, “Sheath-flow-aided inertial microfluidic cell sorter for high-throughput blood sorting,” 20th International Conference on Miniaturized Systems for Chemistry and Life Sciences (MicroTAS 2016), Dublin, Ireland, October 9 – 13, 2016. (4) Joshua Kim, Sun-Jun Park, Thao Nguyen, Michael Chu, Jonathan D. Pegan, Michelle Khine, “Highly stretchable wrinkled gold thin film wires,” Applied Physics Letters, v. 108, paper 061901, 6 pages, (2016). (5) J.M. Nokes, R. Liedert, M.Y. Kim, A. Siddiqui, M. Chu, E. Lee, M. Khine, “Reduced Blood Coagulation on Roll-to-Roll, Shrink-Induced Superhydrophobic Plastics,” Advanced Healthcare Materials, v. 5, pp. 593 – 601, 2016. (6) Jason Heikenfeld, “Non-invasive Analyte Access and Sensing though Eccrine Sweat: Challenges and Outlook circa 2016,” Electroanalysis, 28(6), pp. 1242 – 1249, June 2016. (7) Xiao Wang, Xiaodi Yang, Ian Papautsky, “An integrated inertial microfluidic vortex sorter for tunable sorting and purification of cells,” Technology, 4(2), pp. 88 – 97, June 2016. (9) Charbel Eid, Juan G. Santiago, “Influx and Production Rates in Peak-Mode Isotachophoresis,” Analytical Chemistry, 88 (23), pp. 11352–11357, November 2016. (10) Charbel Eid, Juan G. Santiago, “Assay for Listeria Monocytogenes Cells in Whole Blood using Isotachophoresis and Recombinase Polymerase Amplification,” Analyst, 142(1), pp. 48-54, January 7, 2017. 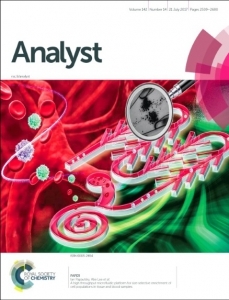 (11) Vishak Venkatraman, Ralph Liedert, Kenneth Kozak, and Andrew J Steckl, “Integrated NFC power source for zero on-board power in fluorescent paper-based lateral flow immunoassays,” Flexible and Printed Electronics, 1(4), paper #044002, 6 pages, November 7, 2016. 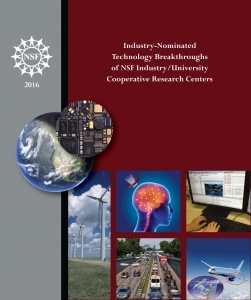 (12) J. Pegan, J. Zhang, M. Chu, T. Nguyen, S.-J. 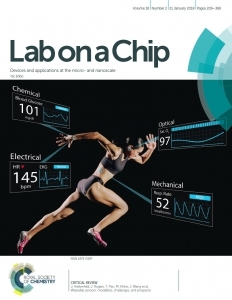 Park, A. Paul, J. Kim, M. Bachman, M. Khine, “Skin-Mountable Stretch Sensor for Wearable Health Monitoring,” Nanoscale, vol. 8, pp. 17295 – 17303, 2016. 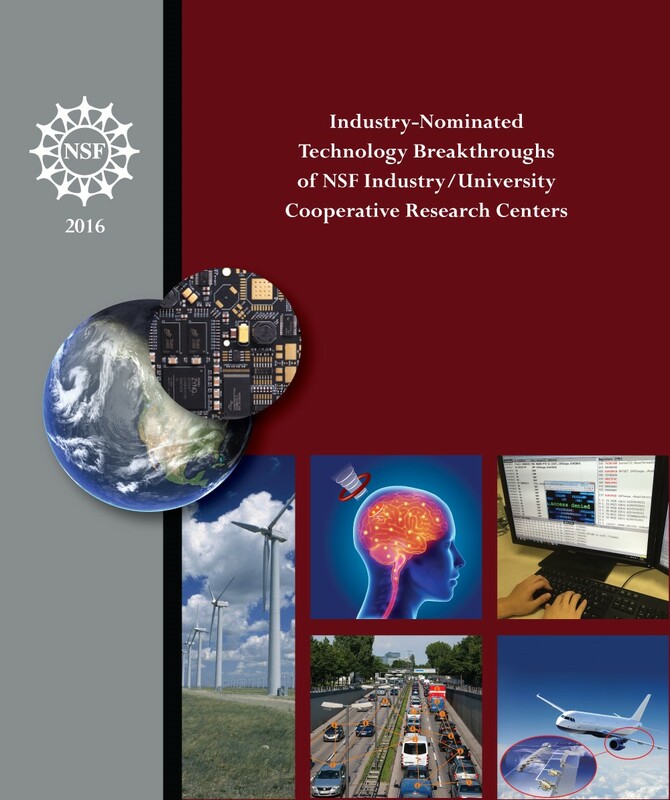 (13) R. Peng, Z. Sonner, A. Hauke, E. Wilder, J. Kasting, T. Gaillard, D. Swaille, F. Sherman, X. Mao, J. Hagen, R. Murdock, J. Heikenfeld, “A new oil/membrane approach for integrated sweat sampling and sensing: sample volumes reduced from μL’s to nL’s and reduction of analyte contamination from skin,” Lab on a Chip, 16(22), pp. 4415-4423 , November 21, 2016. (14) Xiaolong Qiu, Trisha Westerhof, Marissa Pennell, Katrina Henrikson, Edward L. Nelson, Jered B. Haun, “Microfluidic Devices for Mechanical Dissociation and Filtration of Tumor Tissues into Single Cells,” Biomedical Engineering Society (BMES) Annual Meeting, Phoenix, Arizona, October 11 – 14, 2016. 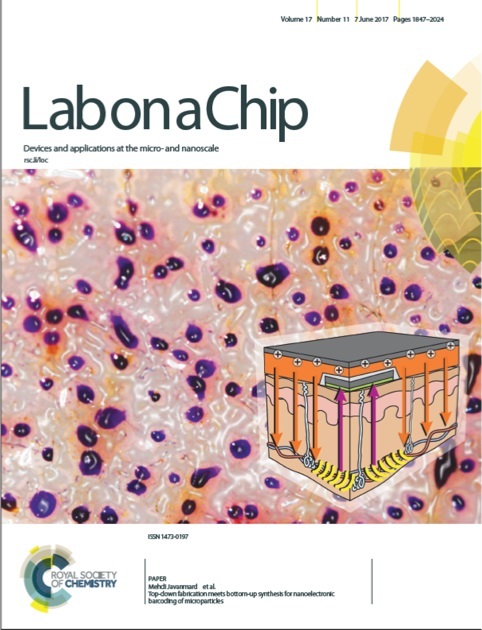 (1) A. Hauke, L. S. Selva Kumar, M. Y. Kim, J. Pegan, M. Khine, H. Li, K. W. Plaxco, J. Heikenfeld, “Superwetting and Aptamer Functionalized Shrink-induced High Surface Area Electrochemical Sensors,” Biosensors and Bioelectronics, v. 94, pp. 438 – 442, August 15, 2017. (2) Sarkis Babikian, G.P. Li, and Mark Bachman, “A digital signal processing assisted microfluidic PCB for on-chip fluorescence detection,” IEEE Transactions on Components, Packaging and Manufacturing Technology, 7(6), pp. 846 – 854, June 2017. (3) Sthitodhi Ghosh, Gopa Kurup, Michelle S. Lee, Abraham P. Lee, and Chong H. Ahn, “A Mass Manufacturable Thermoplastic Based Microfluidic Droplet Generator Using Rapid Injection Molding And Solvent Bonding Method,” 19th International Conference on Solid-State Sensors, Actuators and Microsystems (Transducers 2017), Kaohsiung, Taiwan, pp. 1758-1761, June 18 – 22, 2017. 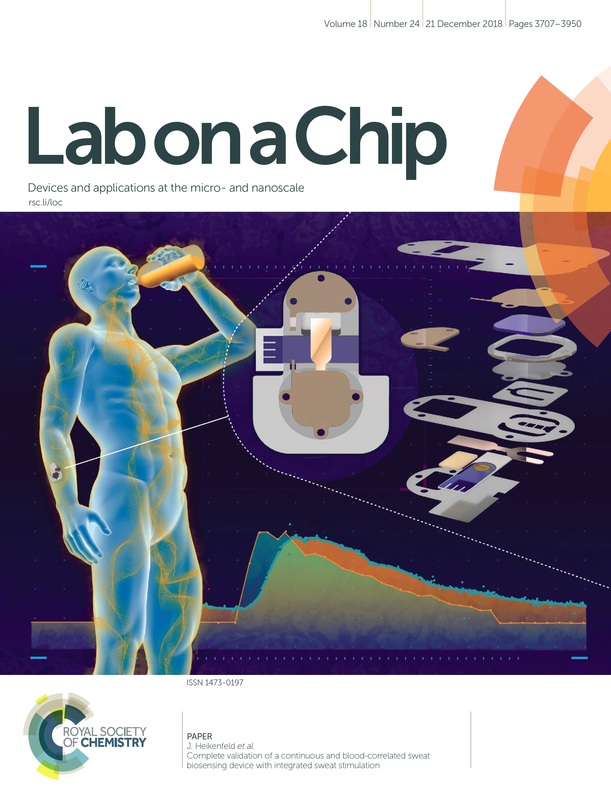 (6) Xiaolong Qiu, Trisha M. Westerhof, Amrith Karunaratne, Erik Werner, Pedram P. Pourfard, Edward L. Nelson, Elliot E. Hui, and Jered B. Haun, “Microfluidic device for rapid digestion of tissues into cellular suspensions,” Lab on a Chip, 17(19), pp. 3300 – 3309, October 7, 2017. (7) Adam Hauke, Nicholas Twine, Phillip Simmers, Zachary Sonner, Ryan Norton, Jason Heikenfeld, “ An Integrated Microfluidic System for Continuous Wearable Sweat Sampling and Sensing: Solving Issues with nL Sample Volumes and Skin Contamination,” 21st International Conference on Miniaturized Systems for Chemistry and Life Sciences (MicroTAS 2017), Savannah, Georgia, USA, October 22 – 26, 2017. (8) G.K. Kurup, Abraham P. Lee, “High-Efficiency Single Cell Encapsulation and Size Selective Sorting of Cells in Femto-liter Droplets,” 21st International Conference on Miniaturized Systems for Chemistry and Life Sciences (MicroTAS 2017), Savannah, Georgia, USA, October 22 – 26, 2017. (9) G.K. Kurup, Abraham P. Lee, “Controlled One Cell- One Bead Encapsulation in Droplets by Liquid-Liquid Interfacial Shearing,” 21st International Conference on Miniaturized Systems for Chemistry and Life Sciences (MicroTAS 2017), Savannah, Georgia, USA, October 22 – 26, 2017. (10) Neha Garg, Trisha Westerhof, Dylan Boyle, Edward Nelson. Abraham P. Lee, “Size Sorting and In-situ Labeling of Whole Blood Using Acoustic Microstreaming,” 21st International Conference on Miniaturized Systems for Chemistry and Life Sciences (MicroTAS 2017), Savannah, Georgia, USA October 22 – 26, 2017. (11) Xiaolong Qiu, Trisha M. Westerhof, Erik Werner, Amrith Karunaratne, Pedram P. Pourfard, Jeremy Lombardo, Edward L. Nelson, Elliot E. Hui, Jered B. Haun, “Microfluidic Device for Rapid Digestion of Tissues into Cellular Suspensions,” Biomedical Engineering Society Annual Meeting (BMES 2017) , Phoenix, Arizona, October 11 – 14, 2017. (12) Xiaolong Qiu, Marissa Pennell, Jeremy Lombardo, Griffith Wagner, Elliot E. Hui, Jered B. Haun, “Microfluidic Filter Device for Dissociation of Aggregates and Tissues into Single Cells,” Biomedical Engineering Society Annual Meeting (BMES 2017) , Phoenix, Arizona, October 11 – 14, 2017. (13) Vishak Venkatraman and Andrew J. Steckl, “Quantitative Detection in Lateral Flow Immunoassay using Integrated Organic Optoelectronics,” IEEE Sensors Journal, 17(24), pp. 8343 – 8349, December 15, 2017. 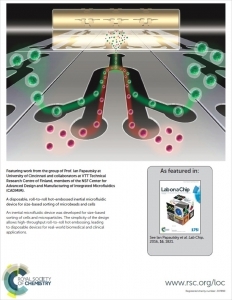 (14) Gopakumar Kamalakshakurup and Abraham P. Lee, “High-Efficiency Single Cell Encapsulation and Size Selective Capture of Cells in Picoliter Droplets based on Hydrodynamic Micro-vortices,” Lab on a Chip, 17(24), 4324 – 4333, December 21, 2017. (16) Xiaolong Qiu, Jen-Huang Huang, Trisha M. Westerhof, Jeremy A. Lombardo, Katrina M. Henrikson, Marissa Pennell, Pedram P. Pourfard, Edward L. Nelson, Pulak Nath, and Jered B. Haun, “Microfluidic channel design optimization to improve hydrodynamic dissociation of cell aggregates and tissue,” Scientific Reports, volume 8, Article number: 2774, doi:10.1038/s41598-018-20931-y, published online February 9, 2018. (17) Neha Garg, Trisha M. Westerhof, Vick Liu, Robin Liu, Edward L. Nelson, and Abraham Lee, “Whole Blood Sorting, Enrichment and In Situ Immunolabeling of Cellular Subsets using Acoustic Microstreaming,” Nature Microsystems and Nanoengineering, vol. 4, 17085, doi:10.1038/micronano.2017.85, published online February 26, 2018. (1) Jacob Somerson, Kevin W. Plaxco, “Electrochemical Aptamer-Based Sensors for Rapid Point-of-Use Monitoring of the Mycotoxin Ochratoxin A Directly in a Food Stream,” Molecules, 23(4), 912; April 15, 2018. doi:10.3390/molecules23040912. (4) Andrew Steckl and Prajokta Ray, “Stress Biomarkers in Biological Fluids and Their Point-of-use Detection,” ACS Sensors, v. 3, pp. 2025 – 2044, Sept. 28, 2018. (7) Shima Dalirirad, Andrew Steckl, “Aptamer-based Lateral Flow Assay for Point of Care Cortisol Detection in Sweat,” Sensors and Actuators B: Chemical, published on line November 30, 2018. Will appear in print: v. 283, pp. 79 – 86, March 15, 2019. (8) Ning Ma, Gopakumar Kamalakshakurup, Mohammad Aghaamoo, Abraham P. Lee, Michelle A Digman, “Label-Free Metabolic Classification of Single Cells in Droplets using the Phasor Approach to Fluorescence Lifetime Imaging Microscopy”, Cytometry, Part A, Journal of Quantitative Cell Science, 8 pages, December 11, 2018. DOI: 10.1002/cyto.a.23673. (9) Andrew Jajack, Isaac Stamper, Eliot Gomez, Michael Brothers, Gavi Begtrup, Jason Heikenfeld, “Continuous, Quantifiable, and Simple Osmotic Preconcentration and Sensing within Microfluidic Devices,” PLoS ONE, 14(1): e0210286, 16 pages, January 16, 2019. (10) Lancy Lin, Michael Chu, Sun-Jun Park, Julia Alice Zakashansky, Michelle Khine, “Conformal Stretch Sensors for High Resolution Motion Sensing and Control,” Macromolecular Materials and Engineering, 1800520 (7 pages), January 17, 2019. (1) Sthitodhi Ghosh, Gopakumar Kamalakshakurup, Abraham P. Lee, Chong H. Ahn, “A Mass Manufacturable Thermoplastic Based Microfluidic Droplet Generator on Cyclic Olefin Copolymer (COC),” Journal of Micromechanics and Microengineering, v. 29, 055009, 9 pages, April 10, 2019.